Just for the sake of comparison, I compiled data directly from the RBI to track Debit Card Vs Credit Card spending habit by consumers in India. 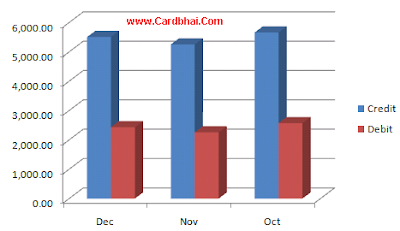 For the quarter ending DEC-2009, Indians spent Rs 16,423.66 cr on Credit Card and Rs 7,262.95 cr on their debit cards. Additional data reveals that – the spend of Rs 16,423.66cr on Credit Card Plastic was done by 6.03 cr transactions thus making every transaction worthy of Rs 2,723. The spend on Debit Card was Rs 7,262.95 involving 4.34 cr transactions thus the Average ticket size of each Debit Card Transaction being Rs 1,673. Though the Number of Credit Cards in circulation has gone down, the spending has increased which implies that Banks have been able to retain just the quality customer with long standing banking relationship. Questions and Comments can be posted on the Forum. This entry was posted on Thursday, May 13th, 2010 at 4:58 am	and is filed under Credit Adviser.